Hi, I’m Ian, the founder of Bursaking.com.my. For the last few months, I had received a handful of requests to cover on stocks where their stock prices have moved acutely, either up or down, over the last 6 months in my case studies which I issued them regularly on Tuesday and Friday morning to my pool of readers at Bursaking.com.my. Are You Speculating thinking that You are Investing? Most know very little about their stocks that they have bought into as they are just buying ‘stock codes’ in hope that they would ‘somehow’ go up in prices. In a way, the mindset is likened to one who buys lottery tickets from Magnum 4D in hope of receiving a jackpot. Here, I am not against you if you are speculating in search for some excitement and fun from the stock market. But, if you sincerely wish to improve your financial standings through investing in stocks and believe that it involves speculation and prediction of stock prices, I would like to encourage you to change your mindset about stock investing. In this article, I felt that it is timely for us to revisit the basics of stock investing as profoundly explained by Warren E. Buffett, billionaire stock investor. 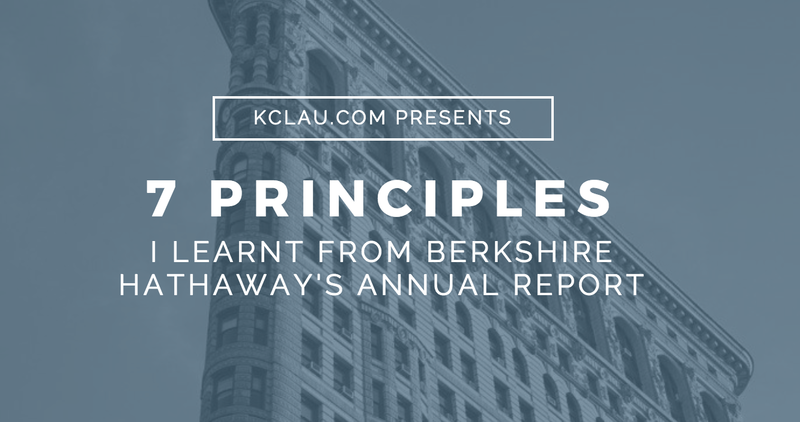 Thus, here are 7 investment principles that I learnt from Berkshire Hathaway’s Annual Report 2017. Charlie and I view marketable common stocks that Berkshire owns as interests in businesses, not as ticker symbols to be bought or sold based on their ‘chart’ patterns, ‘target’ prices of analysis or the opinions of media pundits. Warren Buffett is an advocate of business-like investing in the stock market. It means, buying shares of a stock is viewed as a decision to be a part-owner of a business where you intend to hold onto it over the long-term or ‘indefinitely’. Here, I would list down 5 stocks that Warren Buffett had invested and has held their shares for a minimum of 10 years, not 10 months or 10 days. For new businesses, the key qualities we seek are durable competitive strength and high-grade management, good returns on the net tangible assets required to operate the business, opportunities for internal growth at attractive returns, and finally, a sensible purchase price. Instead of looking at stock prices, Buffett would first study the stock’s business model, its management team, its financial results, and assess its ability to grow in the future. All of these qualities are studied beforehand, way before he even considers its stock price. If the business is desirable, Buffett would only buy its shares if the price is right. Here is a question: ‘Would you pay RM 50 for a great fish or RM 10 for a rotten fish?’. If you think about it, a rotten fish is worthless regardless of its price. You can’t eat it. Hence, isn’t it logical to first assess the quality of a fish before even considering its price? In Buffett’s case, the same wisdom applies to stocks. We are not interested, however, in receiving suggestions about purchases that we might make in the general stock market. I realised, there are many who believe that ‘success in stock investing’ depends on advices, recommendations, and tips from friends, family members, financial media, and stockbrokers. Most are seeking a free and simple answer of what to buy today. If stock investing is that simple, then, all of us should be quitting our day job or business and become a millionaire stock investor ourselves. The message is clear: ‘Success is stock investing is not about asking for tips and recommendations about what stocks to buy today.’ The reason why you would ask for tips is because you do not have your own acquisition criteria before you invest in the stock market. Besides, here is another nugget of wisdom. If a billionaire stock investor has set himself acquisition criteria for a stock, shouldn’t we who own much lesser than Buffett have our own criteria established before investing? What do you think? Large Purchases (Minimum of US$ 75 million in Pre-Tax Earnings). Good Return on Equity while Employing Little or No Debt. Our goal is to directly own a diversified group of businesses that generate cash and consistently earn above-average returns on capital. ‘Should I invest for capital gains or dividend yields?’ This question is an age old one and remains frequently asked by new budding investors. Buffett, who had achieved a Compounded Annual Growth Rate (CAGR) of 20.9% in market value of Berkshire Hathaway’s shares for 50 years, has revealed his ‘secret sauce’ for investing and that is to focus on cash flows. Why cash flows? Because it leads to capital gains. How? If a business has good cash flow management, it has the ability to reinvest its cash flow to expand its business. This includes development of new products, expansion of plants and markets and even acquisition of new businesses which would expand a stock’s sources of income. With more income and cash flows, the stock would then be revalued at a higher price as it has more income-producing assets. The success of a stock’s ability to invest its capital is measured by calculating its return on equity (ROE). If a stock makes RM 1 million in annual earnings from a capital (shareholders’ equity) of RM 10 million, then, its ROE is 10% per annum. Suffice to say, Buffett would prefer a stock with higher ROE than one with little or no ROE as it is efficient in using capital to generate wealth to its investors. A depressed stock market is likely to present us with significant advantages. It tends to reduce the prices at which companies become available for purchase. It is easier to buy small pieces of wonderful businesses – including the ones we already own – at attractive prices. Berkshire would benefit from a sinking stock market and it is good news for Berkshire. Buffett is an accumulator of fundamentally good stocks. He does not build his wealth from stock trading or speculating. If Buffett paid US$ 1 to invest in one share of a good business, then, the same share at US$ 0.80 would obviously is a better deal than US$ 1. Instead of selling, Buffett would accumulate more of these shares, averaging down its cost per share for the same stock as they are offered at attractive prices. The financial calculus that Charlie and I employ would never permit our trading a good night’s sleep for a shot at a few extra returns. I never believed in risking in what my family and friends have and need to pursue what they do not have and do not need. Here is the thing. Even Buffett, the world’s greatest investor, is human and had made costly investment mistakes. I believe, as we build our wealth investing in stocks, we are bound to make some mistakes or lose some of our capital along the way. This is despite us being prudent with our stock investments. This is why, no matter how confident you are, it is best to learn about a handful of risk management principles and apply it strictly to your portfolio. Remember this: A good night sleep is definitely worth a lot more than taking unnecessarily high risk in order to generate higher returns. It is always helpful to have some cash – despite it not bringing any sort of gains financially. Buffett has been investing in the stock market for 50+ years. He has seen the Nixon’s Shock (1973-1974), the Black Monday (1987), Dotcom bubble (2000), and the Global Financial Crisis (2008-2009). To him, stock market boom and bust are normal and expected. In these times, when it happens in our future, instead of panic, stock investors like Buffett would be in the stock market to buy great companies at discounted prices. In fact, if an investor bought Berkshire Hathaway at US$ 72,000 in 2009, his investment would grow to US$ 326,706 as I write (November 2018), hence, giving him an impressive return of 18.30% per annum. Once again, the best time to buy a good stock is when the market is bad. I would highly recommend anyone who sincerely want to become a savvy stock investor to read writings of Warren Buffett. Hence, the link below is where you can download his Annual Report to enjoy his writings. « Previous Post 5 Questions I Have on P2P Home Financing in Malaysia Next Post » The Rich Invest for Cash Flow. The Others Aim for Capital Gains.